The idea of a breakfast fundraiser is simple. 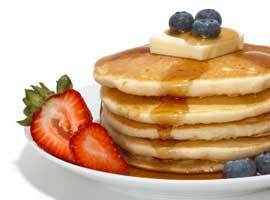 All participants pay an entrance fee, usually a flat fee, for all-you-can-eat pancakes. This usually includes other breakfast items as well such as eggs and sausage, coffee and juice, etc. First you’ll need a facility that your local health department will find acceptable for food preparation and you’ll need some people on your crew who have food handling experience and/or permits. Be sure to check with your local health department for all rules before embarking on this fundraiser. cooking, serving, cleaning and collecting money. The whole point of the event is to raise money, so make sure you factor in the cost of equipment, supplies, rental fees and food before setting the price for tickets. To allay some of the costs, seek donations from local businesses. A grocery store may be willing to supply some of the cooking ingredients such as pancake mix, eggs, syrup and milk. Other donations, such as the cost of table and chair rentals, table cloths and other equipment can also be supplied by local businesses, perhaps in exchange for an ad in the event program. Breakfast is one of the easiest and cheapest meals to prepare and serve to a large group. It does help, however, to have some people readily available who have handled pancake fundraisers before, since there are lots of issues to work out, such as how much food to buy, how and when to start each task, and even how to promote your event to get a big response. “Variety’s the spice of life, that gives it all its flavor,” wrote 18th century English poet William Cowper. So don’t fret if your fundraiser runs out of maple syrup. There’s a whole new world of new toppings to try: from Jell-O pancake syrup to whipped cream and fresh fruit. The pancakes you serve at your fundraiser can be eaten either hot or cold, and you can fill or top them with a sweet or savory sauce or condiment. Potato pancakes are popular in some European countries such as Germany and Poland, and they are a good fundraising idea. You can also sell Scandinavian pancakes, usually served with jam and/or ice cream, although they may also be served as a main dish with an assortment of savory fillings.